Sometimes the forest roads in national forests make the best hiking trails. Such is the case with FR 5031 in Pisgah National Forest. Located near Courthouse Falls on the far southwestern side of Pisgah, near the boundary with Nantahala National Forest, FR 5031 is a means of getting from a drainage bowl to Farlow Gap on Shuck Ridge. For mountain bikers, you could connect at the gap with the Daniel Ridge Loop. For hikers, it’s a delightful grassy gambol through new growth hardwood, past mammoth rocky outcroppings and across several picturesque mountain streams. We followed Forest Road 5031 on Tuesday, February 3, 2015 between 11:45AM and 2:45PM. Our plan was to visit Courthouse Falls off FR 140, then backtrack to FR 5031 for the hike to Farlow Gap, returning the same way. Hike Configuration: Up and back. Blaze: None. Forest road. Hike Rating: Moderate. Uphill most of the way, but not overly steep. Trail Condition: Excellent. Double track forest road. Some manageable creek crossings. Mostly grassy, comfortable tread. Starting Point: Trailhead along Forest Road 140. Trail Traffic: We had the forest all to ourselves on this beautiful sunny day. How to Get There: From Brevard, NC take Hwy 64 12 miles to Hwy 215 and turn right. Drive 10 miles up 215 and Forest Road 140 is on the right just before a sharp curve. Take the very steep and curvy FR 140 approximately 2.2 miles to the junction with FR 5031 on the right. Courthouse Falls Trail is about a quarter mile past FR 5031 on the left. The drive up Scenic Hwy 215 always seems to take a long time because of all the twists and turns, but it is quite picturesque. Following the North Fork of the French Broad River through Pisgah National Forest, there is plenty to see. Once on Forest Road 140 north of the little community of Balsam Grove, you climb the western flank of Shuck Ridge in earnest. Even curvier than 215, it’s best to have an AWD vehicle to navigate all the potholes and exposed rock in the road bed. We reached the junction with Forest Road 5031 little more than a couple miles after turning onto 140, but we wanted to pay a visit to Courthouse Falls first. Only another quarter mile past 5031, the trailhead is on the left. Park on the right just past a small bridge over Courthouse Creek. This trailhead is the northern terminus of the Summey Cove Trail that takes you to this hidden gem that is tucked away in its own natural amphitheater less than 10 minutes down the trail. After getting our fill of the waterfall, it was time to drive back to the gate at the start of Forest Road 5031. Immediately it was obvious this is not your typical forest road. There is no gravel, at least not that we could see, so the road bed is nice and soft and easy to walk. It was still covered with downed leaves from Autumn in places, so our steps created that swishing sound as we passed through. After 15-20 minutes we reached a junction of 5031 with FR 5033, another option for future exploration of Chestnut Creek. Despite the lack of gravel road bed, it was obvious that 5031 is regularly maintained. There had been recent work at all the creek crossings to help prevent erosion, with fresh grass plantings and even straw to protect the seed. Based on the size of the saplings in the lower miles of the trail, this area had been logged in the past 30-40 years, and we suspected they were keeping the road in good shape so it could be logged again in the not-too-distant future. We saw lots of acorns and hickory nuts on the ground as well as the occasional tulip poplar tree. There were hardly any signs of evergreens in this forest though. We were surrounded by mountains. To our right the long, straight passage of Shuck Ridge as it crossed over Pilot Mountain and Sassafras Knob and on to Farlow Gap. Straight ahead is the 6,000 feet of Chestnut Bald standing above the Blue Ridge Parkway, and at one point we could see the great stone face of Devils Courthouse high above. Off to the west, our left, is Tanasee Ridge that demarcates the boundary between Pisgah and Nantahala National Forests. As you would expect on a road, the pitch of the ascent is gentle enabling a relatively easy climb. Stops for the occasional breather were required less frequently. 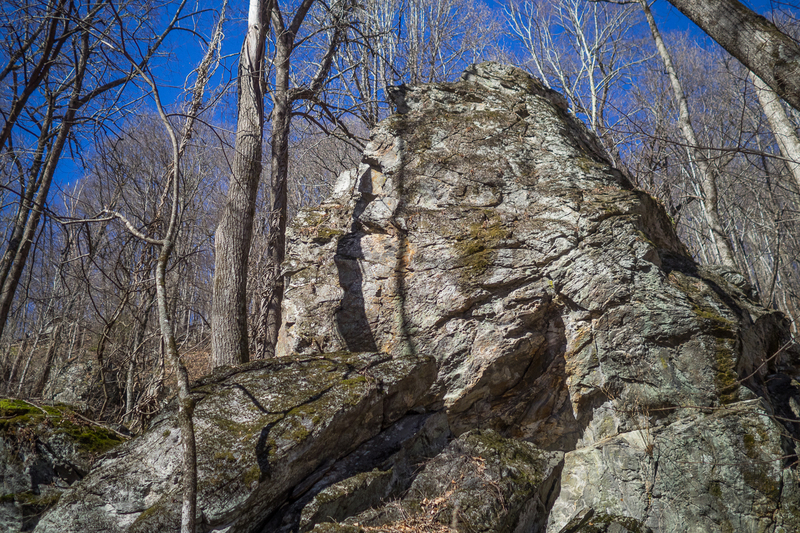 Since we got a relatively late start, it was past noon and we were pondering a spot for lunch when we happened upon a massive outcropping a hundred yards away on the left side of the trail. The entire hillside was strewn with house-sized granite fins and boulders as if there had been an enormous landslide centuries ago. We decided to go exploring. This grand stand of granite became the backdrop for our forested picnic. We sat at the base and enjoyed hot soup and cider, and studied the other hefty stones that were strewn about. There were seeps of water running down the hillside from underground springs. We decided to come back here in warmer weather and climb the steep hill while exploring the aftermath of this impressive landslide. Following our lunch we pressed forward on 5031 as it continued to parallel Shuck Ridge several hundred feet above. We were getting closer though. We began to hear the tell-tale sound of rushing water, and then could see Kiesee Creek down below to our right. Eventually we reached the point where the creek crossed the road, requiring a bit of a rock hop to get to the other side. That’s the photo you see at the top of this post. The road makes a hard hairpin turn at this crossing, changing direction from north to south. There is quite a bit of whitewater on Kiesee Creek in this area as the terrain is rocky and fairly steep. I have seen photos that indicate multiple waterfalls farther down the drainage. That will perhaps be a further exploration for another day. Soon, the trail turns again, away from the creek and back toward Farlow Gap on the crest of the ridge. The trail steepens at this point, and amazingly, has a really cushiony moss cover. One of the nice surprises about our visit here was the excellent condition of the forest road. It is very well maintained, and as mentioned above, done so without the annoying gravel bed that you usually find on old logging roads. With the steeper ascent also comes switchbacks. We reached another junction, this time with FR 140A, an alternative option for getting off the ridge and back to FR 140, albeit quite lower. 140A is a means of accessing the waterfalls on Kiesee Creek, but is a much more difficult climb. 5031 narrows somewhat at this junction, almost becoming a single track. There is one final sweeping switchback from the southwest back to the northeast, and then you reach Farlow Gap. The options at Farlow Gap are many, especially for mountain bike riders. If you cross the gap you will meet the Daniel Ridge Trail that eventually ends up at Davidson River. You also meet the famous Art Loeb Trail at Farlow Gap. Take a left up Shuck Ridge and you will come to the Blue Ridge Parkway within a hard couple miles. Take a right, and you will cross first over Sassafras Knob and then the magnificent views of Pilot Mountain. It’s a great place to extend your journey. On this day though, Farlow Gap was enough for us. We had come four miles to this point. So back we went, the same way we came. As you can imagine, the descent went very quickly because it was almost all downhill. By the time we got back to the car, it had taken us only three hours to do an 8-mile round trip. That’s one of the advantages of hiking on a road vs. a trail. As we drove back down FR 140 to Hwy 215, my friend Ken asked me if I had ever been to see PARI. PARI? Nope, what is PARI? 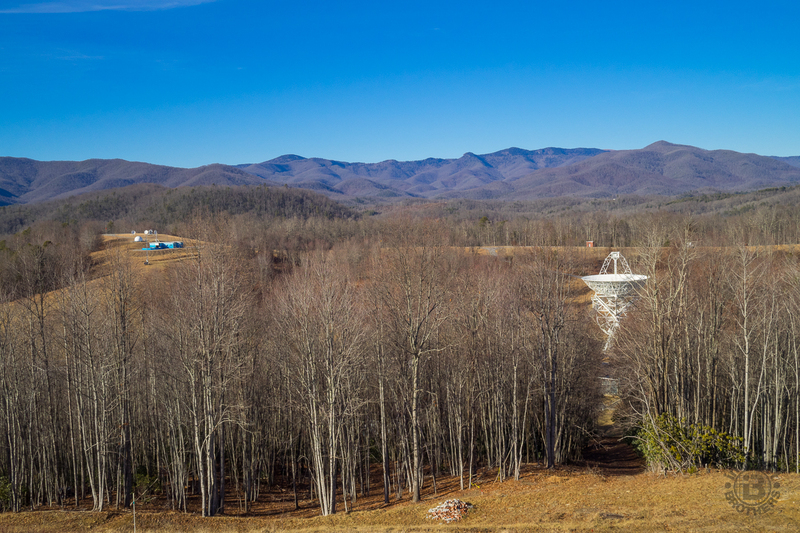 Located west off Hwy 215 just south of Balsam Grove, the Pisgah Astronomical Research Institute (PARI) is a non-profit astronomical observatory situated on the rolling hills of the National Forest. Ken took me to see the radio telescopes at PARI. PARI is located at the site of the former Rosman Satellite Tracking Station, which was established by NASA in 1962. The site was part of the worldwide Spacecraft Tracking and Data Acquisition Network and an integral communications link for the manned space programs Project Gemini and Project Apollo. The facility was transferred to the National Security Agency (NSA) in 1981 and, as the Rosman Research Station, was used as a signals intelligence gathering facility. The site was closed by the NSA in 1995 and turned over to the United States Forest Service. After several years of inactivity, the government proposed to dismantle the facility. Recognizing the utility of the site, a small group of interested scientists and businessmen formed a not-for-profit foundation, which acquired the site in 1999. The observatory is now affiliated with the University of North Carolina through the Pisgah Astronomical Research and Science Educational Center (PARSEC). The photo above, taken from one of the hills overlooking the PARI campus, also identifies the area where we were hiking. The tallest distant mountain on the right side of the picture is Pilot Mountain. Behind Pilot Mountain is Farlow Gap. Follow down from there to the left and you see the drainage that FR 5031 bisects. Devils Courthouse is right-center of the mountain range. I had no idea about PARI. You can bet now that whenever I’m up on Pilot Mountain or Devils Courthouse, I will be looking for the giant 26-meter radio telescopes on the campus of PARI. You can also bet that I will be back to PARI for a longer visit. We also made a quick stop at Living Waters, a Christian retreat, to enjoy the twin waterfalls. I was able to return the favor to Ken of introducing him to something he had not seen before. Shoal Creek meets the North Fork here as side-by-side waterfalls create a lovely aqueous scene. This is private property, so behave yourself when you visit, and don’t park on the Living Waters lot. There is a pullout off Hwy 215 just south of the Living Waters lodges. To summarize, this is an area of Pisgah National Forest where we have so far spent little time. Yes, I had been to Courthouse Falls before, but with this trip we just began to scratch the surface of all there is to investigate in the drainage between Shuck Ridge and Tanasee Ridge. Besides this very nice hike that we did along FR 5031, there is FR 140A, FR 140B, FR 5029, FR 5033, and all the options available once you reach Farlow Gap. I definitely want to go back and further explore the landslide area, and perhaps some day look for the waterfalls along Kiesee Creek.